Miller regularly observes hunters who, two weeks before the hunting season opens, realize they haven’t trained their dog and then decide to put it through hours of training in just a few days. “People think they need to train their dogs for hours to get them ready for hunting. The truth is, 20 or 30 minutes of training daily for a few months is better than three hours a day for a couple weeks. A dog thinks 20 minutes of training is fun, but three hours of training is boring, and he often stops performing if you push him for hours,” Miller explains.According to Miller, keeping a dog interested in a training session is the key to a happy, fit dog that’s ready to hunt. “I will train my dogs in fields one day and in a pond the next. Or, I’ll work them hard in a field and let them play around in a pond. I constantly switch things up to keep things fresh and new for the dog,” Miller says. “They learn much quicker and have more fun this way. A dog won’t learn as much or work as hard for his trainer if he trains in the same place every day. 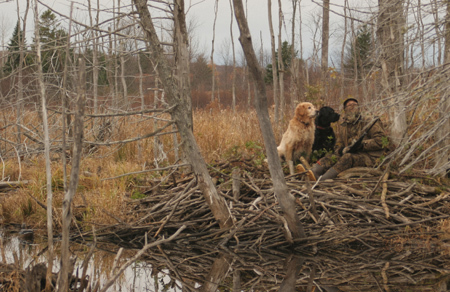 Hunters should have multiple places to train their dog so the dog will have fun and not always know what’s next. If he always trains in the same place, a dog will know what to expect and half-heartedly go through his regular routine. Most of us who hunt waterfowl or upland game all day bring a few snacks and drinks along for ourselves. 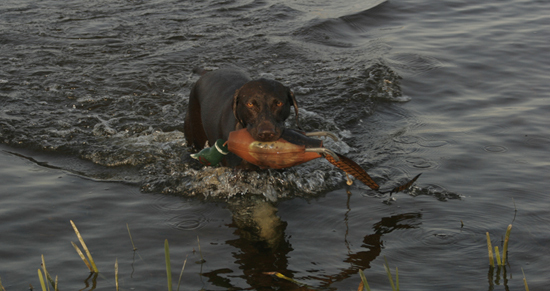 According to Tim Fisher, president of Retrieve Health (800-752-0133; www.retrievehealth.com), a company that makes health products for hunting dogs, we should do the same for our canine companions. 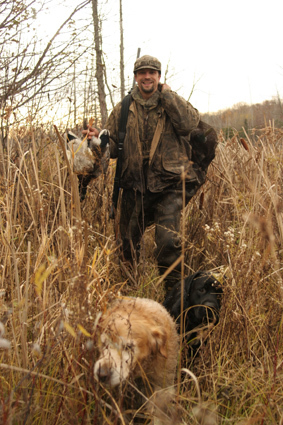 “Every time a hunter stops to fuel up by drinking a bottle of water, he should give his dog something to drink as well,” Fisher says, noting that hunters often overlook the hydration needs of their dogs when hunting. “A lack of hydration in a dog leads to frothy blood. Frothy blood can’t work as efficiently at getting to all the muscles throughout the dog’s body. Lack of blood to the muscles causes muscle atrophy, which leads to muscle and hip problems. The problem can easily be fixed by keeping dogs hydrated,” Fisher adds. Retrieve Health offers Retrieve Hydration, a powder that, when added to regular water and consumed by a dog, actually brings oxygen to the blood and muscles faster than water alone. The Retrieve Hydration Drink contains electrolytes, amino acids and oxygen enhancers.Giving a dog an old-fashioned doggy treat might stop his hunger, but there are many products available that cure hunger and help muscles and joints. Retrieve makes a dog snack called Tri Energy Bars that give dogs vitamins, minerals and glucosamine, all of which give dogs a boost to help them hunt all day and help maintain healthy muscles and joints—- something dogs need to keep them going all season long.